Ever tasted anything that began its life almost 200 years ago? Sweet, thick as syrup, and incredibly complex. I have a hard time convincing folks this is vinegar at all. This is the vinegar about which legends have been woven. It is made from the must - or freshly pressed juice - of Trebbiano grapes. The must is cooked down in open copper kettles to half its original volume, then put into wood to age for a dozen years. But that's just the beginning. It's then taken out and tested by a panel of judges. The qualifiers are graded; from the top, gold, then silver, finally red. Then they return to the wood for another five, ten, twenty, a hundred years or more. During the aging the vinegar is shifted from one type of wood to the next - cherry, chestnut, oak and mulberry all leave their imprint on the flavor of the vinegar. The result of all this is an almost unbelievable concentration of sweet-sour flavor in a dense, intense, brown-black vinegar that hints of berries, grapes, vanilla. There is nothing like it in the world. Loose a few drops on ripe strawberries fresh from the market. Only a tiny amount is released each year, in elegant glass flasks. An amazing treat that you'll always remember. 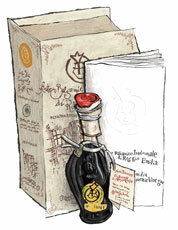 "Gold" is the ultimate grade of Cavalli's traditional balsamics. Incredibly smooth with the silky, slow texture of syrup. Sweet and incredibly complex, it's a vinegar to savor like the finest wine. Gift boxed.